Don't worry this is not going to turn into a gardening blog, but I just had to share my excitement. Last Monday I found myself in a garden centre. It was not a plannned trip, just one of those things that happened. My friend Lucy had to take Dolores to a welder to see about fixing a leak in the roof. When you are trying to turn a van into a living space and mobile artist's book library it is not such a great thing to be able to see the sky through the roof. Especially if you find yourself in Manchester where it rains often. Anyways, I digress, back to the rainy afternoon in the garden centre. Well, we were a little early so it seemed the perfect place to stop. 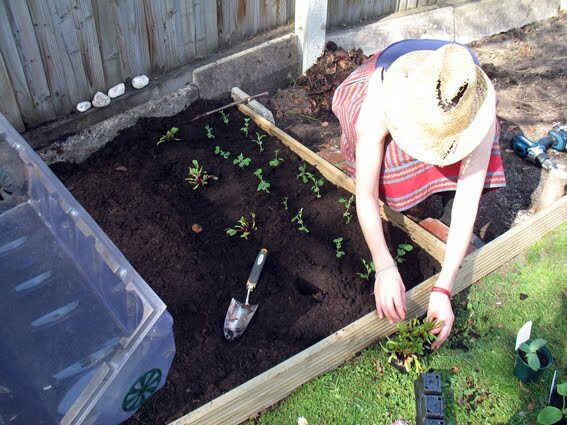 I have always liked garden centres, I can't tell you exactly why, but it feels good to be there and I have been meaning to turn some of our communal garden into a vegetable patch ever since I moved here four summers ago, but then usually lost my can-do-attitude. Well, not this time! The garden centre had its usual effect on me and got me all excited about getting my fingers dirty and growing my own food. So, I got a large trolley and filled it with soil and compost, but much more importantly peas, pumpkins, courgettes, seed potatoes, beetroot, lettuces and an assortment of herbs. Luckily I have some fabulous friends who are not shy to lend a helping hand, who have their own can-do-attitudes and who came round yesterday to help me build some beds and plant my veg, in exchange for the promise of dinner, pancake breakfast and a van valet. There is still some work to do as I ran out of top soil and will need to make another trip to the shops for it (not so easy when you only have a bicycle), but the beds are built and half planted. So this summer, there will hopefully be plenty of fresh stuff, straight from the veg patch to the kitchen, worthy blogging about. 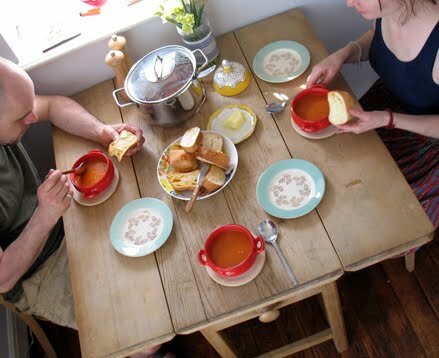 We finished the day with a well deserved late lunch of Creamy Tomato Soup. I changed the recipe a bit, as I had run out of tomato puree, so used 2 1/2tbsp of red pesto instead and I think it was still better. The reason it seemed to taste extra good could simply be that we'd been working hard and were really hungry though. A huge thanks to H, G and B for your elbow grease, to J for trusting me with your tools and to J for dropping by with encouragement and flapjacks!